I've made a few posts here and there over the last year but I figured it was finally time to (re)introduce myself. My name is Matt and I'm a carnivorous plant enthusiast from central Pennsylvania. Some may remember me from quite a while ago in my teenage and early college years (1997-2003) as the kid who ran the website Carnivorous Plants Online. I got into growing these wonderful plants in high school and continued through my first two years of college. Unfortunately, after entering pharmacy school I did not have time to devote to the hobby and went for many years without growing. I graduated pharmacy school in 2007 and for several years thought about getting back into the hobby. 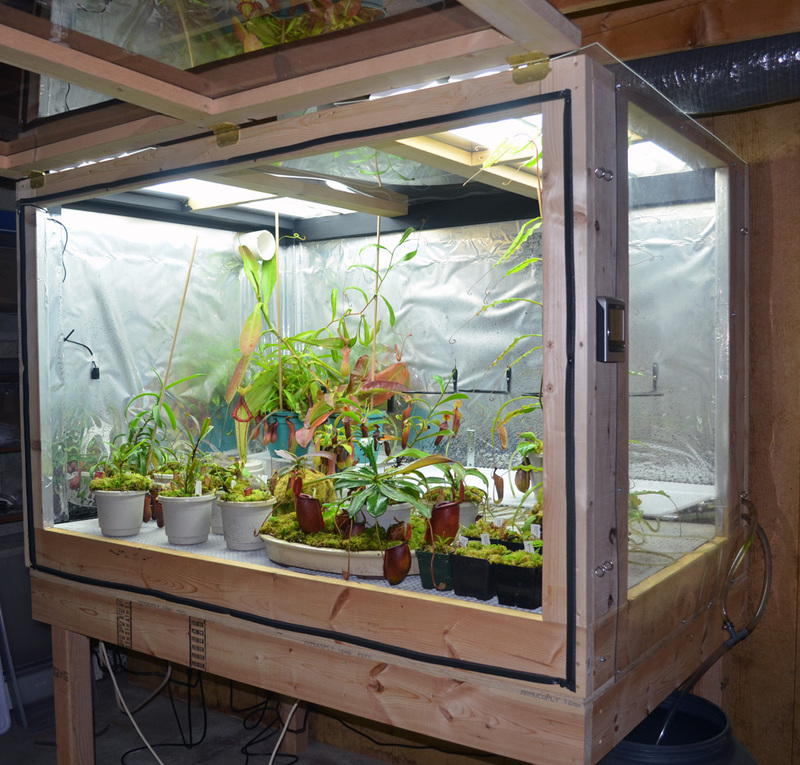 Finally, last March (March 2012), I took the plunge and built a new highland grow chamber as well as setting up some areas both outside and indoors to grow Dionaea, Drosera, Sarracenia, and Cephalotus. My highland chamber is an updated model of a design that I created back in 2000 and had a great deal of success with at that time. I've held off on posting about the new one until I let the better part of a year pass to test it and ensure that my methods would produce good results. The system is elaborate and fairly expensive, but produces very nice growth in addition to being nearly carefree. 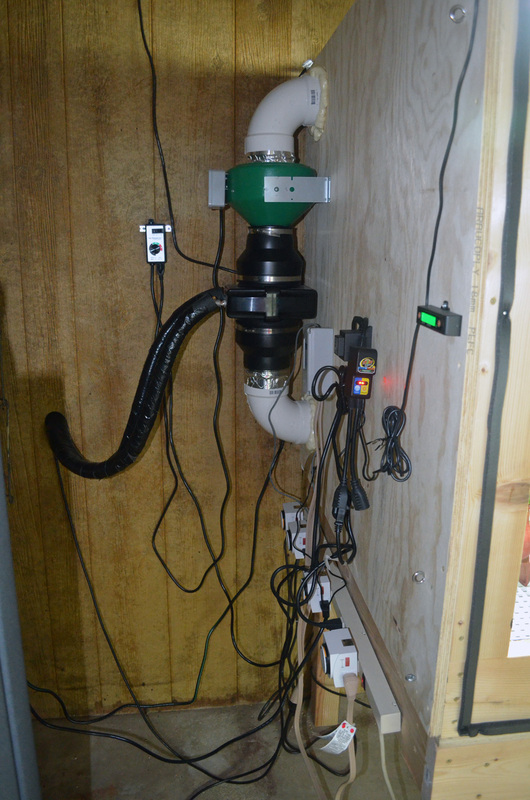 The grow chamber uses timers to control lights, water pumps, and a cooling system, as well as a hygrometer and ultrasonic misting device built into the ventilation system to maintain humidity. The chamber measures 6' wide x 4' tall and 4' deep. The clear side and front are made of lexan and the font door is hinged at the top so it can be opened for easy access. The tank is made entirely from standard lumber and finish pine plywood. The bottom 6 inches of the chamber have been fully waterproofed with a product called "Rubberize It". 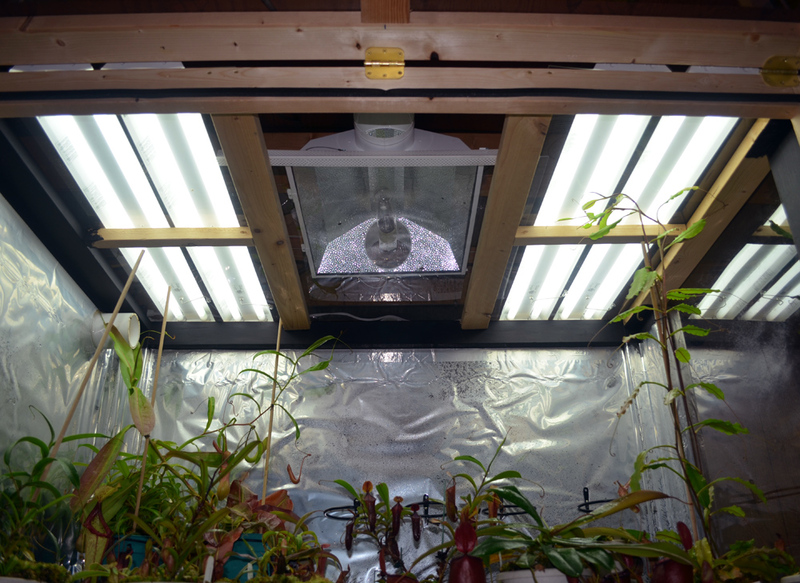 The non-windowed back and side have been wrapped in mylar to aid in light reflection back onto the plants. 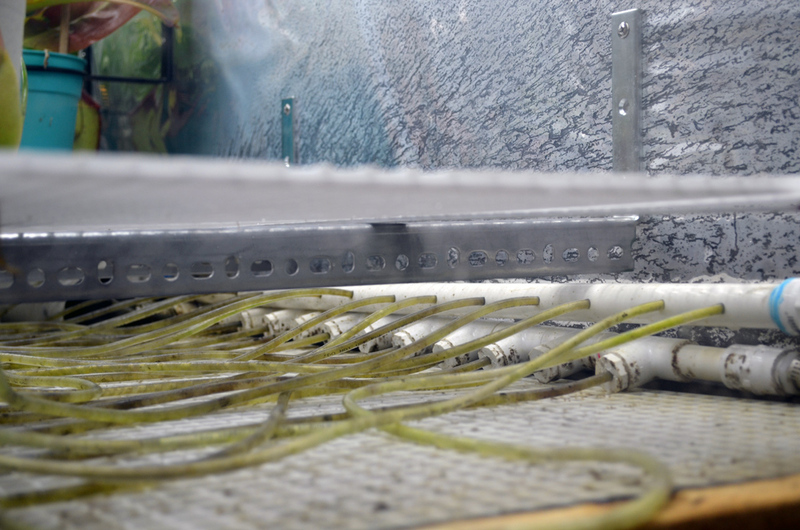 The top of the tank is also enclosed by lexan save a small area about 1' x 2' to help maintain humidity while allowing a small area for heat escape and gas exchange. The lighting is a bank of eight 48" standard T8 daytime fluorescent bulbs as well as a Hortilux Blue 400 W Metal Halide Lamp. The T8s run on a 14 hour photoperiod and the MH runs on a 10 hour photoperiod in the middle of this time. The watering system comes on for about 15 minutes per day and individually waters each pot via individual tubing. 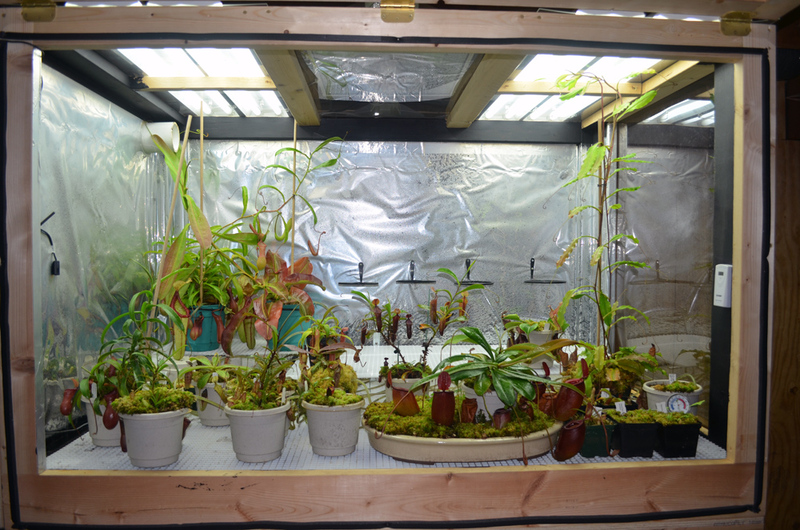 I use a standard mix of 80% live long fiber sphagnum and 20% orchid mix (fir and hardwood bark, perlite, and charcoal) for all of my nepenthes. In the bottom of each pot I have about a 1" layer of lava rock to aid in drainage. This mix works well with the small single tube watering system due to the ability of the sphagnum to transfer moisture evenly through the pot. The tubing is hooked into drilled pvc piping which is fed by a large submersible pump in a 30 gallon barrel underneath the tank. 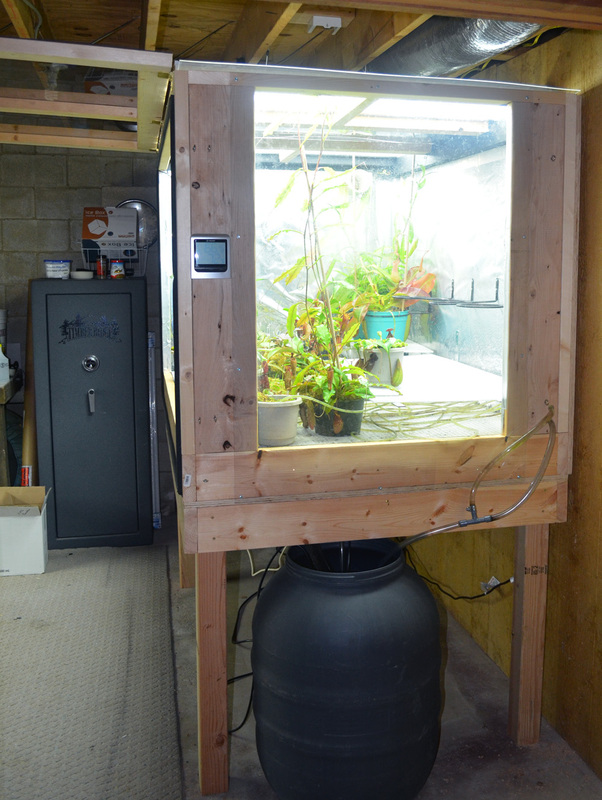 All of the plants are suspended above the bottom of the tank by pvc legs and drop ceiling eggcrate. The water can drain free from the pots and collect in the bottom of the chamber. The excess water then runs out a drainage pipe and back into the barrel. I use reverse osmosis water and change out all the water in the system only once per year. On the left side of the tank are mounted all of the electronic controls and sensors. A bank of timers run the lights, pumps, and cooling system. The large piping in the back is a ventilation system with an adjustable speed in-line fan which is always circulating the air inside the tank. The fan draws air in from the top of the tank and returns it to the bottom underneath the plant shelving. A hydrometer made by Zoo Med maintains the humidity at a constant 80% RH by turning on or off an ultrasonic disc fogger which is built into the return pipe of the ventilation system. At night for 6 hours the system turns on a pump which pumps freezing cold coolant through a circular in-line radiator/heat exchanger (the black unit mounted below the green fan). My basement maintains a temperature from 60-65 F year round. The MH bulb raises the temperature of the chamber to the low to mid 70's F during the day, and the cooling system drops the temperature to the low to mid 50's F at night (maintaining those temps for about 6 hours). 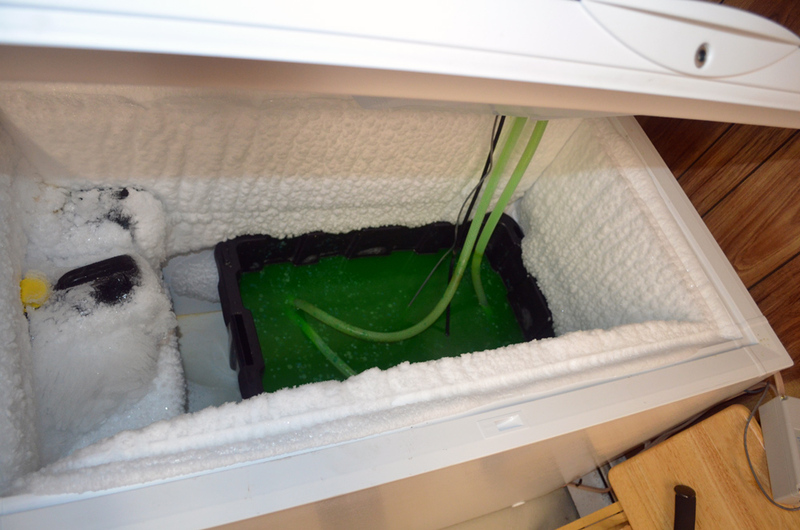 The coolant is pumped from a 25 gallon reservoir inside a chest freezer in an adjacent room. 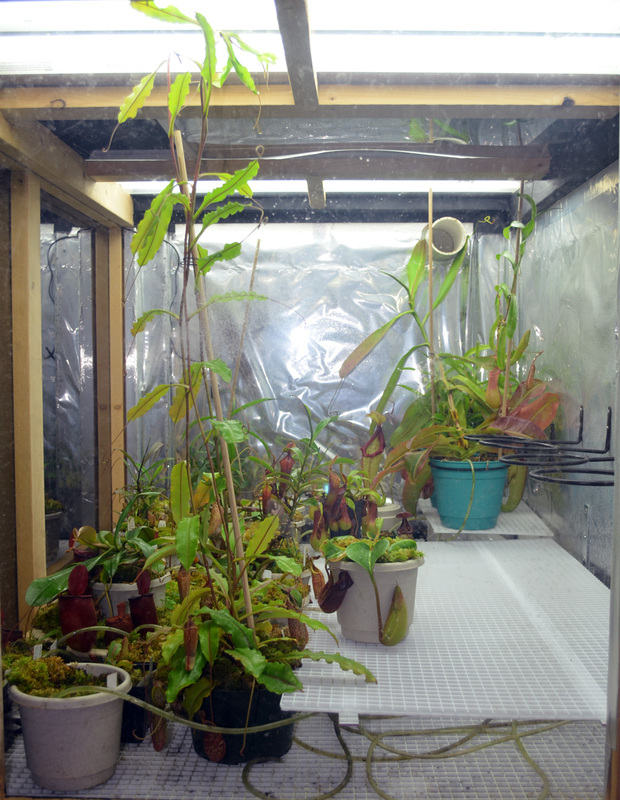 I'm delighted to be growing these wonderful plants again and I look forward to becoming more active on the forums and in the carnivorous plant community. I'm always happy to discuss my growing experiences or ideas so please feel free to ask questions. Welcome back to the hobby, Matt! Quite a neat and elaborate setup you've got there. Love the plants, they look great. 'Specially that lowii x muluensis bush. Looking forward to seeing you around the forum. Wow thats incredible!! Super high tech, but at the same time straightforward. I'm sure it works great! I hope to one day have the resources to make a similar grow chamber. Nice job Matt! I can make out most but not all of the plants in there. If you have time, it would be awesome to see all the different plants that your growing individually. Thanks for sharing! Salt Lake City, Utah. U.S.A. I have a 2' deep by 4' wide by 6' tall lowland chamber built, and will be buiding a highland chamber soon as well in which I want to incorporate many of the same elements, including self watering. There's some definate inspiration for me here! Ummm. Can you fill a Rx for a sedative, the help calm my excitement about your setup. Like someone already said. Your sophisticated setup is quite easy to follow. A clean direct approach. Very nice indeed. Thank you all for the compliments! I've always loved this hobby and I enjoy building projects like this also. I've been giving some thought lately to constructing a second chamber for lowlanders. If/When I get that project underway I'll definitely post the details here. Your chamber is amazing! It looks great, and your plants show that it works well also. To me your plants looked small, but when I read the size of the chamber I realized that they must be huge. Great growing and awesome Chamber.